Sharing is Caring….we say it often, we believe it, we really want our children to believe it BUT it is a concept that seems far beyond my children! Under certain, very controlled,conditions my children share very well, usually when they all benefit from the sharing. If, for example, we are sitting quietly colouring ( an extremely rare occurrence ) then the colours will be passed generously amongst my children, if they all have a number of sweets there may be some praiseworthy swapping and sharing amongst each other. If, however, one person has something that none of the others have, then it becomes a prize possession, and prize possessions don’t get shared. No amount of cajoling can convince my children to let another play with it. I try to avoid these situations and everything gets bought in fours but there are many situations that are beyond my control…the number one offender is the Party Bag. If only one child has been invited to the party there is already a slight simmering resentment amongst the others, so when the ‘chosen one’ arrives home with the Party Bag it usually pushes them over the edge. We have a rule about the contents being divided out at home, but of course, no bag contains 4 of any one thing and so all hell breaks loose…I now have a deep seeded hatred of party bags! Recently my much adored mother in law arrived for lunch to celebrate her birthday. She had been given a Helium Balloon as part of her birthday haul and she thoughtfully brought it with her for the children to play with. There was 1 balloon, there are 4 of them, when there are 4 people waiting to have ‘their turn’ it can seem like eternity till your turn arrives. Of course because you’ve had to wait so long for your turn you try keep the treasure item for as long as possible and thus delaying further the next persons turn. 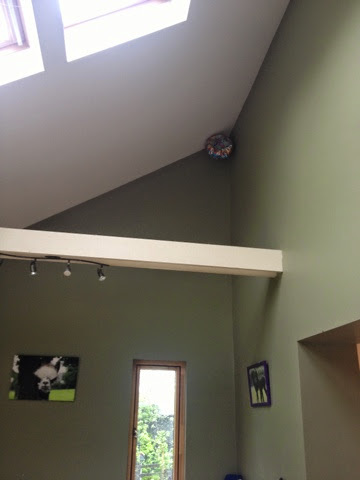 Our lovely luncheon celebration turned into a lesson in refereeing and the aforementioned balloon was silently cursed on a number of occasions..,it was a huge relief when the blasted thing escaped and ended up in the highest corner of the dining room, far beyond our reach ( and keeping many cobwebs company)….it is still there today!! I know they have to learn, I know it is important, but just for now…if there isn’t four of something( and we do not expect anyone to provide four of anything), pleeeeeeessse, for our sanity, just keep it for yourself.